glass wall unit door. Silver finish Conchiglia handle. Satin, 4 cm thick, Peperino granite top. Etoile chimney hood. The polished metal inserts stand out on the deep graphite colored, silk-effect lacquered doors and their color perfectly matches the brilliant silver finish of the Conchiglia handle. The work space is generous and practical while the under counter sink discreetly adds to the elegance of the Peperino granite food preparation unit. The wall panels, in silk-effect ash lacquer like the doors, are finished on the top edge by a decorated cornice which beautifies the arrangement while creating an intimate and cosy atmosphere. 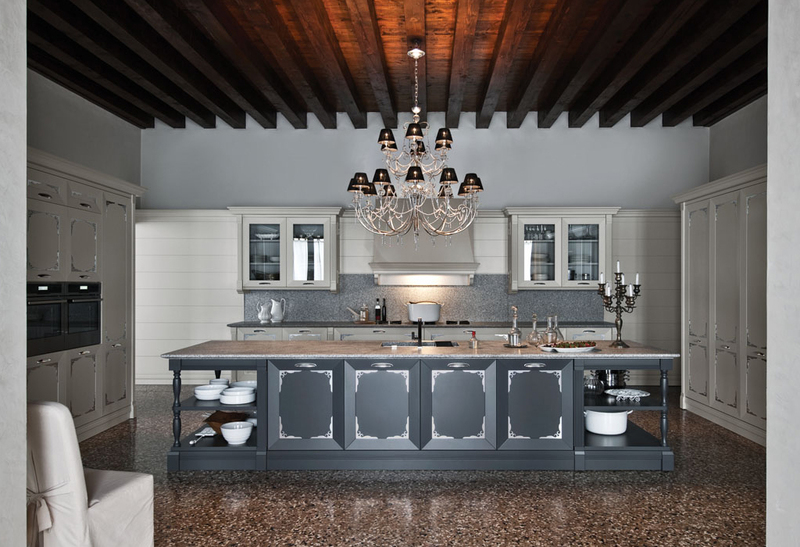 Etoile’s excellence is expressed in the rich decorative elements that give the kitchen its rhythm and consistency: the stone tops have an elegant shaped edge; the vertical fluted pilasters space out the base, wall and tall units. The plinth reproduces the fluted decor of the pilasters and boldly underlines the arrangement. Etoile follows the latest trends by combining different finishes: in this case the graphite color of the island contrasts with the ash color of the other elements, infusing energy into the arrangement.